Bertalan de Némethy became a legendary figure as coach of the United States Equestrian Team show-jumping squad. During his twenty-five year tenure, he led the team to sustained international triumph in 6 Olympics, 5 Pan American Games, 4 World Championships, and countless international horse shows. Teams coached by de Némethy scored victories in 144 Nations Cups, while his individual riders won no fewer than 72 international Grand Prix, 44 Championships, and hundreds of individual classes all over the world. De Némethy formulated his own training techniques of horse and rider based on his Hungarian Cavalry School background and the principles of classical equitation. From this evolved the celebrated “de Némethy style,” the precision and elegance of which are emulated throughout the world today. Classic Show Jumping: The de Nemethy Method is an exposition of this gold-medal technique, illustrated with more than 100 photographs of riders and horses that Bertalan de Némethy has personally trained. 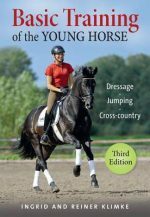 Covering all aspects of horsemanship, it is the only book to detail de Némethy’s proven method for training world-class jumpers. Classic Show Jumping: The de Némethy Methodincludes: basic principles of equitation; longe line techniques; the basic training of a horse; modern cavalletti and gymnastic systems; competing over courses; plus much, much more. The material is presented clearly, with easy-to-follow, step-by-step instructions. Every level of rider—beginner, intermediate, and advanced—can benefit from Bertalan de Némethy’s genius as a trainer and teacher.